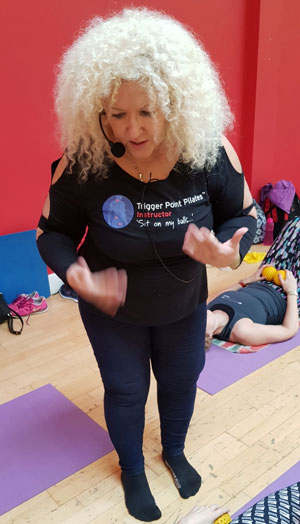 Thank you for your enquiry about training as a Trigger Point Pilates Instructor. The training costs £175 with manual and first year licence only. Early booking rates apply at certain times these you will see at time of booking in the booking links. Early bird course booking rates applied up until 2 weeks before the training. The training enables you to teach this fantastic proven releasing and realigning bodywork system as a Trigger Point Pilates® Teacher. For Pilates Background Instructors / PTs /Core Instructors / Sports Therapists / Physiotherapists. Manuals given on training day. Pre-arrival Paper to read and answer then bring to the course. Visual, Verbal and Written assessment. Before coming to the course pre-reading and recap on muscles and applied anatomy is advisable. I recommend you read a book. If you have a therapy background I recommend, Ruth Duncan’s book Myofascial Release. Yes, it is for clinical therapists but it will give you a great insight into the world of Myofascia and may inspire you to start to train as a clinical therapist. To understand the world of fascia more, read Anatomy Trains by Thomas Myers. It can blow your mind, if you’re not a great reader don’t panic. If anatomy is your weakness then go online and revise muscles and bones! Read a children’s educational anatomy book. There is a pre-arrival paper about fascia to complete before the day and bring to registration, answers are in the text. This is just to give you an insight to fascia. On the Day: Bring a pen & notebook. Wear warm loose clothing and workout kit. You will exercise barefoot. Drink water throughout the day otherwise you will tire as fascia needs hydration. 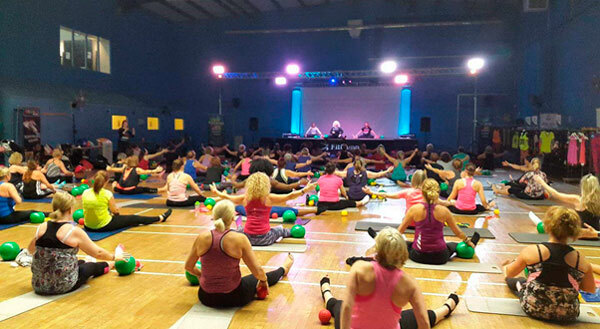 • Welcome followed by a Releasing Trigger Point Pilates™ Class with all equipment. • Analysing Exercises, working in pairs teaching each other assessing/observing the moves, feeling to visual. • You will learn about why we teach the class as a training system first as there is a definite order of the exercises for release for the spine that is safe and effective for all levels of fitness. • Understanding how Fascia can attribute to Posture and alignment problems. Discover movement to help enhance posture. • Understanding how to Release the body by Self Myofascial techniques (SMR) using equipment. • Understanding the Effect of Breathing on fascia and movement. • Understanding Contra-indications: How to adapt an exercise for a class member. • There is Continual Teaching practice through the day and assessment. • Final Teaching practice at end of the day. Assessments are visual, verbal and written. Please note the written assessment can be done after training day if one needs more time on theory. 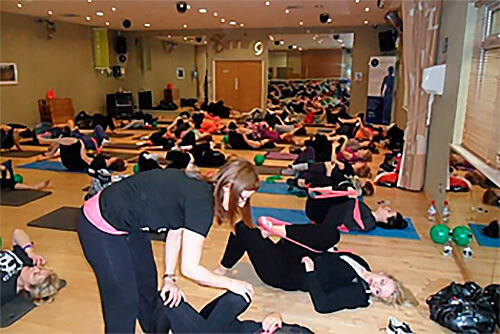 On successful completion and assessment of Level One you are awarded the Certificate of Completion and the training allows you to start up a Trigger Point Pilates™ class, as long as you are insured to teach. You will be able to be part of the TPP™ Register on the web page class finder www.tppilates.com. Join the Private Facebook Group for exercise updates to down loads and questions. *Please note there is no Monthly license fee involved but a Yearly minimal fee of £30. TPP Instructors will get discounts on further training /masterclasses and special offers on equipment, clothing & books. Once a year you need to attend further TPP™ Fascia for Fitness Workshops to enhance your teaching and knowledge and renew your licence. You are entering a different world to fitness and may feel inspired to train as a Myofascial therapist to work in sports and physiotherapy clinics. This you can do if you have the basic entry of a body worker i.e. sports therapist, physiotherapy, chiropractor, or osteopath. Discover how to apply Myofascia and Trigger Point principals in your classes. Learn how to teach a class that will undo Muscular restrictions. Discover Exercises that help treat Myofascial pain. Learn how to balance your training to avoid injury. Discover how to teach a Matwork class to PT. TPP BodyRestore and Sequencing — The next step! Discover how to enhance your TPP matwork teaching with smooth sequencing that will balance the myofascia Bodywork. Plus learn the TPP BodyRestore format that includes hands-on techniques to mind-body exercises . TPP BodyRestore is a lifestyle changer for health and you will keep coming back for more and more. Learn how to balance your training to avoid injury. Discover how to teach a matwork class to PT. Discover how to enhance your TPP matwork teaching with smooth squencing that will balance the myofascia Bodywork. Plus learn the TPP BodyRestore format that includes hands on techniques to mind body exercises . Plus learn the TPP BodyRestore format that includes hands-on techniques to mind-body exercises. Update your Women’s Health programming with Shhh! Open the door to the Pelvic Floor the fascia way. A training workshop for instructors and women to discover how to improve their pelvic floor health and lifestyle. This training includes online study. After training there is access to an FB video page with the exercises. "I came to you so tired and in chronic pain, my body screaming. I cannot believe how, as the day progressed, my body changed in a matter of hours. I am hooked!